Who counts as a Muslim, and who does not? Which beliefs and practices are Islamic, and which are not? Many Muslims across the globe hold firm views on such questions. Asked, for example, whether there is only one true way to interpret Islam’s teachings or whether multiple interpretations are possible, half or more of the Muslims surveyed in 32 of the 39 countries included in the study say there is only one true way to interpret their religion. Yet, at the same time, opinion as to which groups or sects adhere to the true interpretation – and which do not – varies significantly among Muslims around the world. One factor that distinguishes Iraq and Lebanon is that, unlike other Sunni-majority countries in the region, they are home to substantial numbers of Shias as well. Rather than reinforcing perceived distinctions between the groups, living side-by-side appears to increase mutual recognition: Solid majorities of Sunnis in Iraq (82%) and Lebanon (77%) recognize Shias as fellow members of the Islamic faith, while overwhelming percentages of Shias in both countries say the same about Sunnis. In countries outside the Middle East and North Africa that are also home to substantial Shia populations – such as Azerbaijan, Afghanistan and Russia – Sunnis also tend to be more accepting of Shias. In some regions of the globe, sectarian divisions appear to have limited importance. This is especially true in Central Asia and across Southern and Eastern Europe (Russia and the Balkans), where respondents tend to be either unfamiliar with the terms “Sunni” and “Shia” or do not have a definite opinion as to whether these groups should be considered members of the Islamic community. The survey also asked about perceptions of Sufis, who embrace mystical or esoteric dimensions of Islam and often mix standard religious practices with a range of supplementary spiritual practices, including the chanting of God’s attributes, ritual dancing or the veneration of Islamic saints. Opinions about Sufism vary widely. Acceptance is broadest in South Asia, where seven-in-ten or more Muslims view Sufis as fellow believers. In other regions, fewer than six-in-ten share this view, although in no country does a majority reject Sufis as Muslims. In many of the countries surveyed, substantial numbers of Muslims say they are unfamiliar with Sufis or do not have an opinion about their status within Islam. Muslims in most of the 39 countries surveyed tend to agree that there is only one true interpretation of Islam’s teachings, although this view is far from unanimous. Across Southeast Asia and South Asia, roughly seven-in-ten in each country hold this view. And in 10 of the 16 sub-Saharan African countries surveyed, six-in-ten or more believe there is only one interpretation of Islam. With the exception of Kazakhstan (36%), clear majorities of self-identified Muslims across Central Asia also subscribe to the notion that there is a single interpretation of their faith. Opinion is more varied across Southern and Eastern Europe. While three-quarters of Muslims in Bosnia-Herzegovina endorse the view that there is only one interpretation of Islam, only about half in Russia (53%) and Kosovo (52%) agree. Even fewer Albanian Muslims (41%) embrace this idea. The most diverse views on Islam’s interpretation are found in the Middle East and North Africa. At one end of the spectrum, super-majorities in Egypt (78%) and Jordan (76%) say there is only one true interpretation of Islam. At the other end of the spectrum, only about a third of Muslims in Tunisia (35%) and Morocco (34%) concur. Beyond these regional variations, views on the interpretation of Islam also vary with levels of personal religious commitment as measured by frequency of prayer. 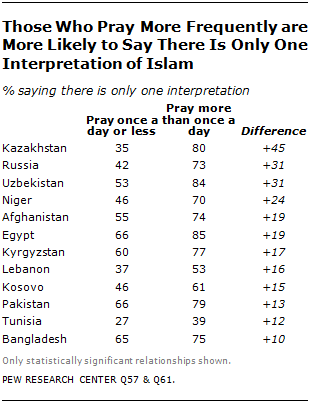 In many of the countries surveyed, Muslims who pray several times a day are more likely than those who pray less often to believe there is a single correct interpretation of Islam’s teachings. When asked whether Sunnis are Muslims, more than half of respondents in 17 of the 23 countries where the question was posed say yes. There is particularly broad agreement on this question in South Asia and the Middle East-North Africa region, with more than nine-in-ten across both regions identifying Sunnis as Muslims. In the Central Asian nations of Tajikistan (98%), Azerbaijan (91%) and Turkey (91%), overwhelming numbers also recognize Sunnis as Muslims. Similar attitudes are evident in Southeast Asia among Thai Muslims (94%). In Southern and Eastern Europe, smaller majorities of Bosnian and Russian Muslims agree (74% and 56%, respectively). In the handful of countries where fewer recognize Sunnis as Muslims, substantial percentages say either that they have not heard of Sunnis or that they do not know whether Sunnis are Muslims. This tendency is most pronounced in Central Asia and across Southern and Eastern Europe, where about four-in-ten or more Muslims in Uzbekistan (72%), Kyrgyzstan (50%), Kazakhstan (42%), Albania (49%) and Kosovo (38%) are either unfamiliar with the term “Sunni” or have no definite opinion. In Iraq and Lebanon – two countries with significant populations of both self-identified Sunnis and Shias – Shia Muslims almost universally agree that Sunnis are members of the Islamic community (99% in Iraq, 97% in Lebanon). In Azerbaijan, another country where both sects have large followings, 78% of Shias agree that Sunnis are Muslims, while 18% disagree. In 13 of the 23 countries where the question was asked, at least half of respondents say that Shias are members of the Islamic faith. However, opinion on this matter is far from universal, and in at least two countries – Egypt and Morocco – the dominant view is that Shias are not Muslims. Overall, Muslims in South Asia most consistently agree that Shias share their religion. At least three-quarters express this view in Afghanistan (84%) and Bangladesh (77%), while about half (53%) agree in Pakistan. Acceptance of Shias as fellow Muslims also is widespread in Southern and Eastern Europe. The one exception is Kosovo, where 36% of Muslims consider Shias as belonging to the Islamic faith. However, a substantial percentage of Kosovar Muslims (43%) either have not heard of Shias or are not sure whether Shias are Muslims. Only about one-in-five (21%) actually reject the notion that Shias are Muslims. In the Middle East and North Africa, distinctions between Sunnis and Shias appear to be better known: in no country in the region do more than a quarter (23%) of respondents say they are either unfamiliar with the term “Shia” or unsure whether Shias are Muslims. In three of the countries surveyed in the region – Tunisia, Jordan and the Palestinian territories – opinion is closely divided on whether Shias are Muslims. In Egypt and Morocco, the prevailing view (52% and 51%, respectively) is that Shias are not Muslims. Only in Iraq and Lebanon do overwhelming majorities (92% and 88%, respectively) acknowledge Shias as Muslims. But when the attitudes of Sunnis in these countries are examined separately, it becomes clear that the Sunni communities in Iraq and Lebanon are much more welcoming of Shias than Sunnis in other parts of the Middle East and North Africa. Indeed, Sunnis in these two countries are at least 23 to 28 percentage points more likely than Sunnis elsewhere in the region to recognize Shias as Muslims. The cases of Iraq and Lebanon suggest that the experience of living side-by-side may increase, rather than decrease, mutual recognition between Sunnis and Shias. And the survey findings indicate that these may not be the only instances where this is true. Pakistan, where 6% of Muslims surveyed self-identify as Shias, is the one exception to this rule. Pakistan’s Sunnis are more mixed in their attitudes toward Shias: half say they are Muslims, while 41% disagree. In five of the six countries where self-identified Shias make up more than 6% of the Muslim population, the size of the Sunni population permits further analysis by age and gender.27 Age differences in Sunni attitudes toward Shias are not statistically significant, except in Lebanon. 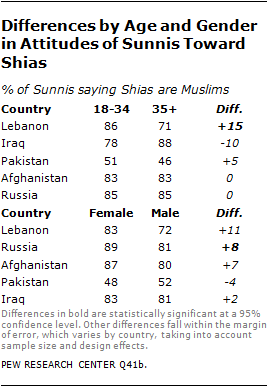 Lebanese Sunnis ages 18-34 are 15 points more likely than those 35 and older to say that Shias are Muslims. Lebanon experienced a civil war along sectarian lines from 1975 to 1991, and this history may help explain the generational difference. Older Sunnis, who came of age during the conflict years, are somewhat less inclined to view Shias as fellow Muslims than are younger Sunnis, who may not have any firsthand recollection of the civil war. Still, a majority of Lebanese Sunnis – of all ages – do accept Shias as Muslims. Across the same five countries, gender differences in Sunni attitudes toward Shias are statistically significant only in Russia, where Sunni women are more accepting of Shias than Sunni men (+8 percentage points). Opinion varies as to whether Sufis – self-professed Muslims who emphasize the mystical dimension of religious belief and practice – are part of the Islamic tradition. In a few countries, they are widely embraced as fellow Muslims. In many countries, however, substantial percentages of Muslims say they are unfamiliar with Sufis as a group; those who are familiar enough to form an opinion are divided in their views toward Sufis. Acceptance of Sufis as Muslims is most widespread in South Asia. Broad majorities in Bangladesh (83%), Afghanistan (77%) and Pakistan (70%) agree that Sufis belong to the Islamic tradition. In the Middle East and North Africa, half or more in four of the seven countries surveyed agree that Sufis are Muslims. Moroccan views on the issue are the most closely divided: 43% say yes, 41% say no, and 16% say they don’t know or they have never heard of Sufis. Across the regions of Central Asia, Southeast Asia, and Southern and Eastern Europe, only in Turkey (56%) and Tajikistan (52%) do more than half say Sufis are Muslims. In most of the other countries in these regions, fewer than a quarter believe Sufis are members of the Islamic faith. This finding reflects, in part, the fact that large percentages of Muslims in these three regions are unfamiliar with Sufis. In both Iraq and Lebanon, Sunnis tend to be more willing than Shias to acknowledge Sufis as Muslims. Iraqi Sunnis, for instance, are 49 percentage points more likely to believe Sufis are Muslims than are Iraqi Shias; in Lebanon, the difference is 18 points. In Azerbaijan, however, there is no significant difference in how Sunni and Shia Muslims view Sufis. The survey also asked about several groups and movements that are based in specific regions or countries. These include Alevis, Alawites and Druze in the Middle East and Central Asia, Ahmadiyyas in South Asia and Southeast Asia and two groups – Islam Liberal and Aliran Kepercayaan – that are mainly present in Indonesia and neighboring Malaysia. Alevis fall within the Shia tradition, and they are most numerous in Turkey. A 69% majority of Turkish Muslims accept Alevis as fellow members of the Islamic faith; only 17% disagree, while 14% are unsure. Alawites and Druze are centuries-old sects based in the Levant region of the Middle East. The former group practices a form of Shia Islam. Among Lebanese Muslims, nearly six-in-ten (57%) believe Alawites share the same faith as themselves, while 38% disagree. Opinion of the Druze leans in the opposite direction: 39% say the sect is part of the Islamic tradition, while about half (52%) believe it is not. In South Asia and Southeast Asia, Muslims tend to be skeptical of regionally or locally based religious sects. For example, Ahmadiyyas, members of an Islamic reformist movement founded by Mirza Ghulam Ahmad in India in the late 19th century, are not widely considered to be Muslims (see Glossary). Out of the five countries where this question was asked, only in Bangladesh do more than a quarter (40%) of Muslims believe Ahmadiyyas are Muslims. In Indonesia and Pakistan, a majority of those interviewed state that Ahmadiyyas are not Muslims, while in Malaysia and Thailand most either have not heard of the group or do not know if it is part of the Islamic tradition. Islam Liberal is a movement in Indonesia that prioritizes ethics over textual literalism. Only 16% of Indonesian Muslims think the movement is part of the Islamic faith, compared with 58% who do not. About a quarter (26%) are either unfamiliar with the group or do not know. Doubts also surround Aliran Kepercayaan, a mystical movement centered in Indonesia that combines elements of Islam with other religious traditions. In Indonesia, relatively few Muslims (5%) say the group is part of the Islamic faith, while fully 80% disagree. In Malaysia, just 9% say Aliran Kepercayaan falls within the bounds of Islam, compared with nearly two-thirds (66%) who have never heard of the group or do not know and 26% who think members of the movement are not Muslims.